Personal news, a Jig Zone puzzle, 3 short takes, and a homemade cartoon (shown). If you would like me to send you cards with links to my articles, add me as a friend. This is today's only article. MSNBC: WOW! Seems like with every passing day, the diggers get that hole bigger & bigger, and deeper and deeper! I'd say it went in dt's pocket, imho. Why not? ugh! PP: Oh! the words! Well done! TP: dt sure can pick 'em, can't he? This is absolutely disgraceful, not only were women harassed, and abused, but management tried to cover this up. It's sickening, and horrible for those women who endured this kind of pain. Cartoon: Uh, oh! Look out below!!! Hi WWWendy! Hope all is good with you. Hope that you have a relaxing day, take good care, and Thanks, Tom. Rachel - Great analogy (and sounds delicious). Yes, MoJo does some decent reporting (David Corn there has had some scoops, including the Steele "dossier.") Seriously, though, Li probably doesn't have to tell reporters where the money went. But he would have to tell law enforcement, should they ask. So, another reason why the current status quo in the Department of Justice is so disturbing. No one there is an Elliot Richardson. The days when there could be an Elliot Richardson are probably now over for good (I'd love to be wrong.) As for WHY this kind of thing is going on, particularly among Asian Americans, you may have to dive into the history of "whiteness," which is not really a thing, but an invented concept. When it was first invented, many groups which are now considered "white" were not. Irish, Italians, even Germans IIRC, were considered "non-whites" but gradually "worked their way up" into whiteness. You may not have followed it, but Asian Americans have, and (not each individual, not even all as a group, but there is a group in there that is) deliberately working to become "white." And there is some progress being made. Ever notice how many alt-righters who managed to get married are married to Asian women? Ever look at Tia Tequila (BBA)? Those are random. But Cindy and Charles mean business. And have money. Other PP - Oh, myyyy (apologies to George)! The production values alone are stunning (if some are barfable). Some songs just lend better to some parodies, too, and this is so on target. TP - We are not wasting time listening to abused women VOTERS and at least trying to bring about some change, or at least some retribution. I assume you don't really want women sitting out the 2020 elections. Cartoon - Sure, the owners were Republican, but certainly not every passenger was. It was a tragedy. Rachel: Mayflower Hotel...has a nice sound, much like mayflower madam! How funny is that? Layers upon layers, perfect analogy for Drumph's layers of scam, piled one upon another. PP: Even in cartoon style, he's got a sh*thole for a face! TP: "We are wasting our time objecting to this. In the Trump sycophancy and the Republican Reich, perversion is a prerequisite, not a liability. RESIST!!" Right on point, just the kind of thing Drumph would look for, first, in a resumé! 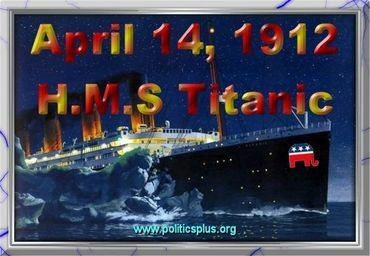 'Toon: Very sad, and an early instance of what can happen when we live by hubris and believe our own myths, as in "Unsinkable!" Even without Mueller’s findings, tRump’s foes have plenty to pin on him. Investigators have probably found out only a teeny bit about Chinese shenanigans at Mar-a-Loser. Rachel: Million of layers and it keeps being tied to tRump, massage owner, guest trying to get into Mar-a-Lago Club and the Mayflower event. All having to do the asian women?? Now they can't find a trace of the money. No donations ever reported???? Crazy. How can they get away with all of these evil doings?? I hope all of this falls and brings tRump ad his cronies down. PP: Speaks such truth about tRump. Agree with Mitchell regarding the face. TP: Does this fool even look at people qualifications??? With the way he picks them is totally insane. All losers. 2:53 For whom the bell tolls? Rachel Maddow. Yes, that spekkoek, as we call it, consists of some very weird layers, all connected by one thing: Drumpf. It seems likely he’d sell out the nation to any type of business or country as long as Mar-a-Lago, i.e. he himself makes money out of it. Sifting through all these layers and their implications certainly warrants an investigation. PP: Strange to see all that truth to come out of Drumpf’s face, isn’t it? After almost three years of lies, it simply doesn’t match. tP: Of course Barry Lee Myers shouldn’t be appointed as head of NOAA if he ran a department with a culture of sexual harassment and discrimination and did nothing about it, but it isn’t the real reason for not wanting him there, is it? As all of Drumpf’s appointees, Meyers isn’t competent enough to run NOAA and very likely will have only one task: sell out to big money, wear the department down with cuts and prevent them from having anything to do with climate change or the environment. Sadly, in the Drumpf era nominees are not vetted on that, but only on their usefulness for the Drumpf administration and the GOP. Puzzle — 4:22 Ding dong the emperor is dead! MSNBC — The “Mille feuille” of political scandal and corruption and all tied to the Dark Lord. I remember as a kid that we would say we were digging a hole in the garden so deep that we’d end up in China. Well it looks like someone did dig to China and the Dark Lord either fell in the hole or, more likely, jumped in. Anything for a buck. Parody Project — “Wasting away in Mar-a-Lagoville” — the Dark Lord certainly is a waste! Great job Don! Think Progress — For many years, hiring managers have tended to hire people like themselves rather than people whose skills and aptitudes compliment the manager’s. Seems to be the case with the Dark Lord. He hires liars, cheats and philanderers . . . just like himself! Cartoon — May the USS Republican Reich follow . . . soon!